Lake Isabella, what is left of it. We munched on freshly picked and chilled grapes on our way northward up the mountains to the Kern River Valley area. We had only planned to be here a couple of days while we scouted out more “natural” camp-sites. However our site at the Kern River Valley Elk Lodge had a mountain and a small lake (with water) view, which was quite pleasant. We spent a couple of days scouting out camp-sites and realizing that we were better off staying at the Elk’s and using it as a base camp. 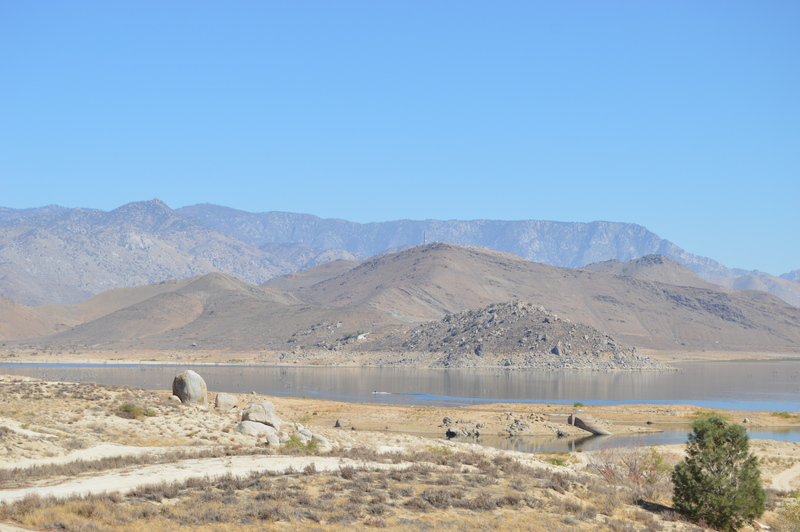 We found that not only is the lake at the lowest level anyone could ever remember, the drought had affected everything that was normal for the community. The drought had taken the green from the mountains and grasslands, the vanishing lake had taken the week-end visitors and vacationers away and their own property values have plummeted. These are resolute and solid folks. They are patient and optimistic that this is a temporary situation. They believe that the rains will come, the leak in the dam will be repaired and that things will again be green and prosperous, albeit someday. The boat ramps were dried out, the lake (if it had water) had warnings about the dangerous stagnant waters and what might lurk below the surface. We decided that water sports might not be our cup of tea this year. 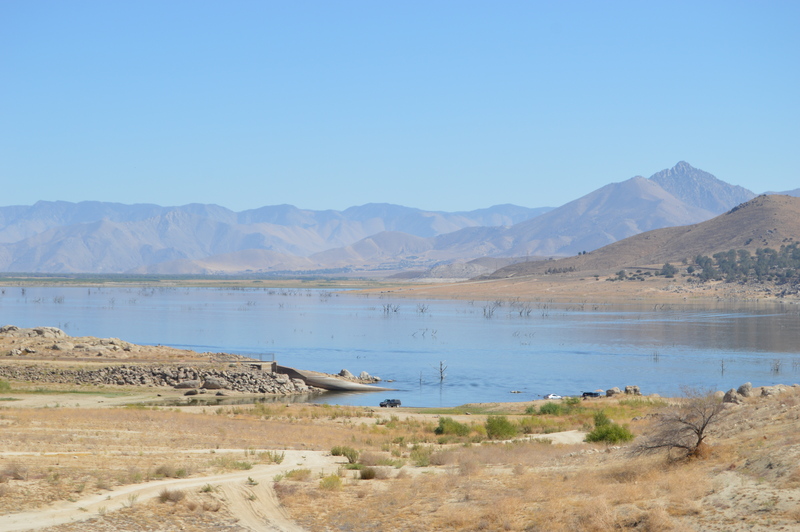 Lake Isabella at its’ lowest ever…. Days trips to the 100 Giants, realizing the campsites and the steep, shoulder-less roads were not a good fit for our rig at this time. We spent a well used afternoon at the Kernville museum with a knowledgeable docent telling us exciting tales of the early days. Touring the Lake and seeing the foundation of the old school that was flooded to make the lake some 50-60 years ago. patronizing the fine restaurants in the area for very sophisticated breakfast feasts. Walking the Fall Festivals and the Hot Rod Show in the area. Pot Luck suppers and cocktails with the local Elks members. Even got a few chores completed. Kern River Valley has become another special place for us, not just because of the beautiful wild environment, large trees, black bears and all, but also because of the wonderful people we met here. we will feel that we have friends here forever. I use to camp with my parents at Lake Isabella in the 70’s. 🙂 It’s so low. I hope it fills up soon I would like to camp there with our new RV.